October 1, 1861, Confederate forces seized the steamer Fanny in the Outer Banks of North Carolina, and all those onboard. My great-grandfather, John Muster, was a private in Company I of the 20th Indiana Volunteer Infantry, after having come over from Switzerland. Thus, John began his years in Confederate prisons that day. After the South captured the Fanny, they used it to patrol that area for the rest of the war, so it was a big loss for the North. After the war, John Muster returned Valparaiso, Indiana, and married his wife Barbara in 1866. Barbara had turned eighteen and John turned thirty-six in 1866; he was twice her age, eighteen years older than her. That's just the type of thing you don't want to find in your family history, but it was more than 150 years ago. What can I say? When you search your ancestry, I hope you like what you find. After getting married, John and Barbara had their first child, my grandfather William Muster, in 1868. After that they had ten more children over over the next nineteen years until John died in 1887. Thus, they had a child every year-and-half or two years. 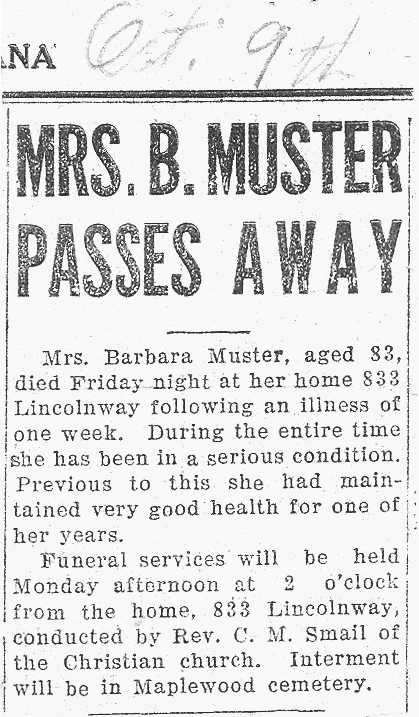 Barbara died in 1931, outliving John by forty-four years. Thus, she raised her younger children as a single mother. Barbara lived in the same house her entire life after coming to America with her parents as a child. I learned from Ancestry.com my great-grandfather fought in the Civil War, but the story came to life when historical researcher Lee Oxford contacted me. He asked if I knew my great-grandfather was captured at the beginning of the war. 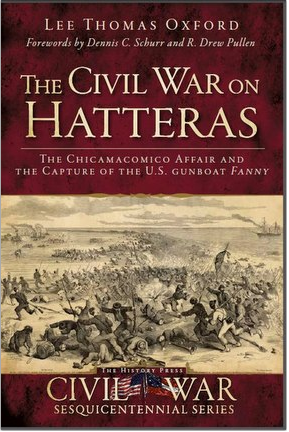 Lee's book on the battle is now available: The Civil War on Hatteras: The Chicamacomico Affair and the Capture of the US Gunboat Fanny, new in May 2013. Lee organized a reunion of the descendents on both sides of the battle, which I wanted to attend. He later told me Hurricane Irene ran the reunion out of town, so I didn't miss much! He still wants to organize another one, and I would love to attend. Directly following the book's release, I met Daniel Swacina, whose wife is a descendant of John Muster, and Jean Renfro, another descendant. Jean is a genealogist who is gathering family information. Jean gave me this obituary for John Muster. 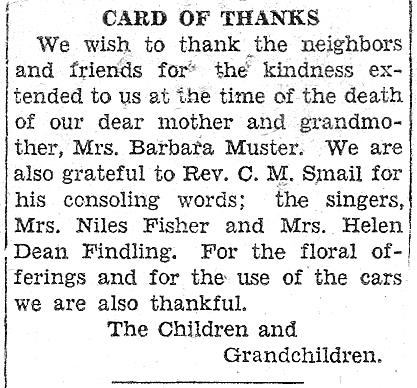 I recently received a copy of my wife's Great-Great Grandfather's obituary (John Muster) from another family member and discovered that he was a Private in Co. I 20th Ind. Vol. Inf., and was captured on the Fanny, and was later paroled. 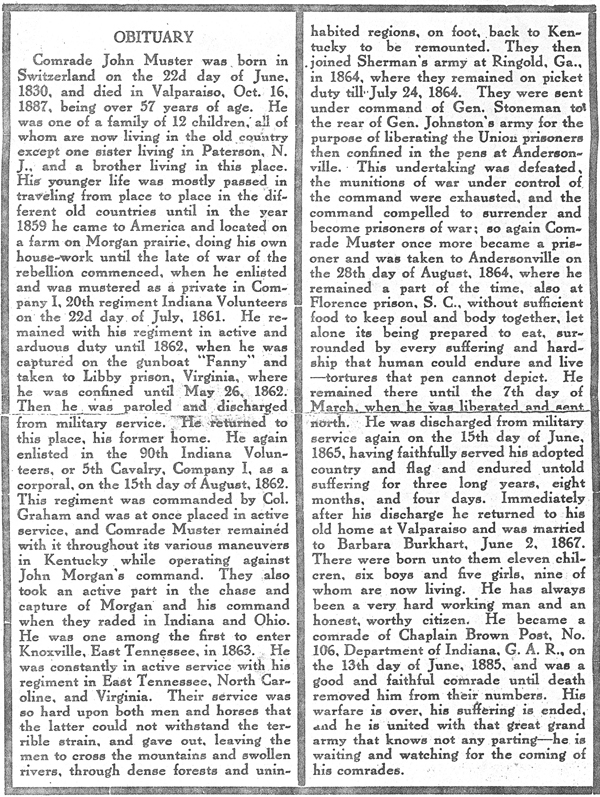 Just 91 days after his parole from Libby Prison he enlisted again on August 15, 1862 as a Corporal in Company I, 5th Cavalry, 90th Indiana Regiment. He was captured again when his unit failed in their attempt to rescue the prisoners being held at Andersonville, and ended up a prisoner there himself along with a number of other members of his unit and transferred a couple of times until the end of the war. 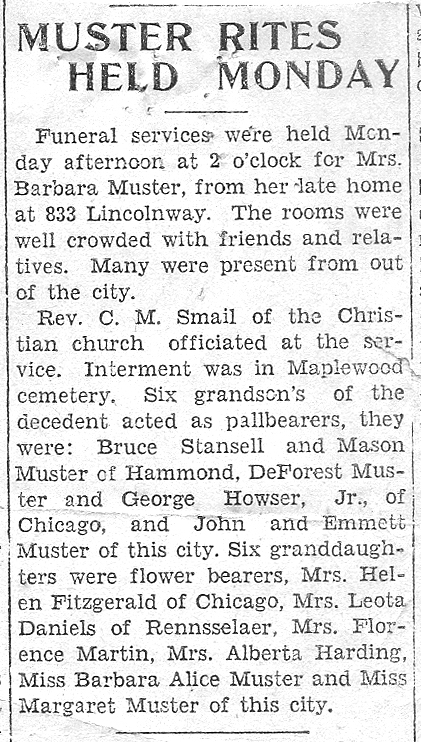 Editor's note: Jeanne Miller* sent me these obituaries and other clippings concerning the death of John Muster's wife, Barbara Muster, October 10, 1931. 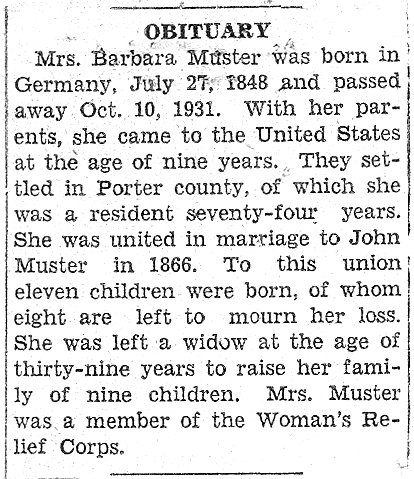 Barbara (Murtin or Burkhart) Muster - b. 7/27/1848 in Baden, France. It was sometimes part of Germany, but when she was born it was the Kingdom of France. 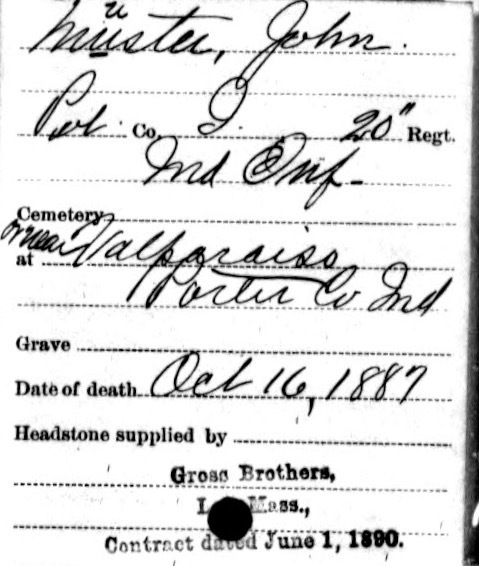 She came to America in 1852 (according to Ancestry.com at four years old; obituary above says nine years old), d. 10/10/1931 Valparasio, Indiana. I believe Barbara's maiden name was Murtin because that's what I found in documents at Ancestry.com. 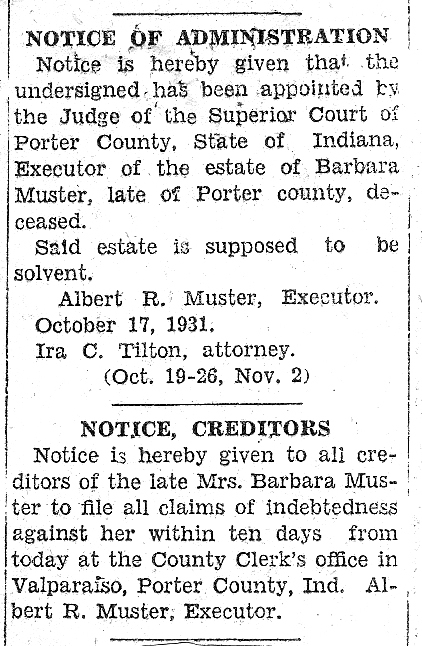 The source of the name Burkhart was the newspaper obituary, which easily could have been wrong. Like, her mother could have been remarried, or the reporter could have been misinformed. More about the Alberta Muster branch of the family, details supplied by Dan Swacina. Alberta Muster married Ross Harding 31 July 1926 in Valparaiso. Alberta was born 2 July 1905 in Valparaiso and died there on 20 Oct 1967. Her Husband, J.E. (as I knew him) was born in Fort Wayne, IN on 6 Nov 1899 and died in Valparaiso 7 Jan 1990. He went by several first names, Ross, Ross Errol, Roswell, J.E., and Jack and I have seen "official" documents with all of those names on them, but no birth certificate that would solve what his first name ACTUALLY was. Alberta Muster was the 3rd of 10 children born to Albert R. Muster (May 1873?) and Margaret A. Mason (May 1875?). They were married about 1892. Alberta & J.E. had three boys, John Scott Harding (Kathy's dad) born Sep 1938, Robert Brooks Harding born in 1942 , and Paul born in 1944 (who died within a few months of his birth). John married Antonia DeGrazia (Toni) in Valparaiso 15 Jun 1957. Toni was also born in Valparaiso in 1938. Kathy was born in Cambridge, MA in Mar. 1958 while John was attending Harvard. He graduated from Harvard and attended medical school at Northwestern University in Chicago. He then served as a flight surgeon in the Air Force. His first assignment was in San Antonio, TX, where Kathy's brother Scott Anthony Harding was born. James R. Muster b: abt. 1913 twins? John and Barbara Muster had all their children in Valparasio, Indiana. If you have, or can find, further information on these people, please contact me. Here's a link to specific questions I'm working on - click here. See also:click here to buy it directly from the publisher.